As the tendency continues for organisations to adopt not one but multiple cloud vendors, information has never been more federated. Real time access to such assets via APIs has therefore become a priority for our customers. 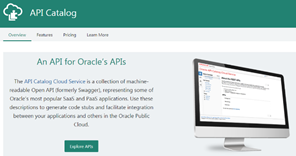 Oracle API Platform Cloud Service delivers a pure-play 3rd generation API solution capable of creating and managing APIs that run in any vendor’s cloud and/or on-premises –whilst keeping the entire platform operations and API lifecycle central in the Oracle Cloud. This flexible architecture means that we can create robust solutions for our customers that really puts them in the driving sit when it comes to managing access to information via APIs –regardless of where they are. The incorporation of Apiary into the platform, only makes it better as developers also get the tools they need to ensure that those APIs are well designed, documented and are easy to consume. Read the complete article here.